Hadashi is a boy with simple dreams... but his life changes when a horrific accident maims his hand! Unable to hold a sword, he's kicked out of his dojo home. But the Orphan Blade is no ordinary sword. When Hadashi comes across the abandoned blade, he finds that not only is he able to wield it - the sword seems to be wielding him! 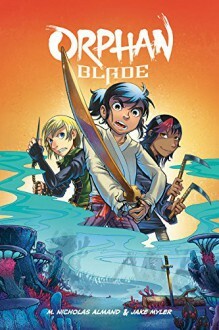 He's not the only one interested in the Orphan Blade, though, and his ownership draws the attention of the Five Fingers of Death - a deadly group of mercenaries who have their own magical and deadly weapons.